← JUDGES: I’D FOLLOW THE LAW BUT I’M TOO BUSY GETTING LAID! Let’s say that tomorrow, out of the blue, there was a complete debt jubilee. Meaning, if you went to bed tonight with $100K in student loans and $3K left until your car is paid off, and a mortgage you’re 20 years from paying off, you wake up in the morning and suddenly none of that is true—you owe no money to anyone. Neither does anyone else. 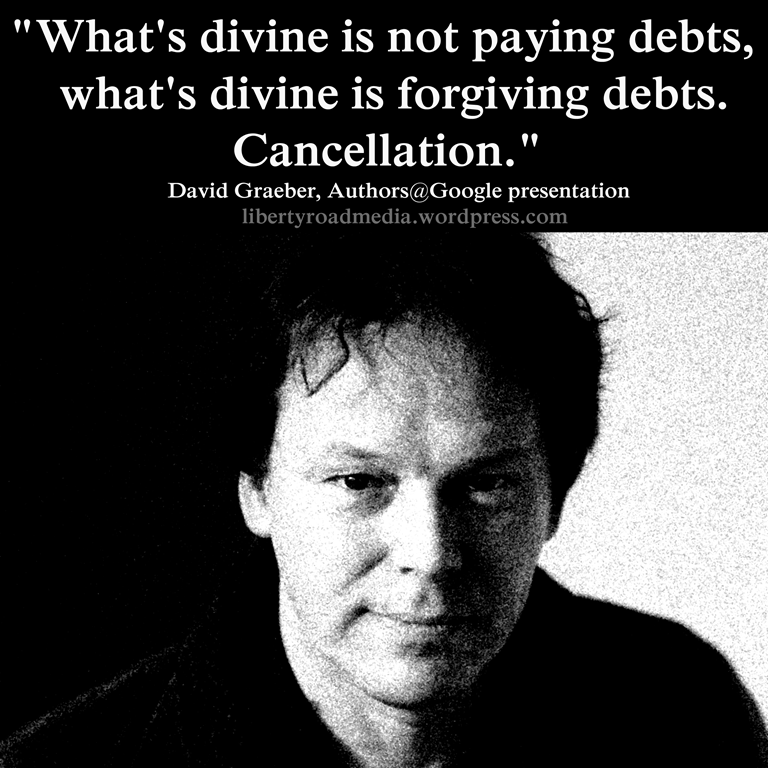 All debt has been written off, expunged, wiped away, cancelled. Does society collapse? Or does it enter a new era of hopefulness? The effect of debt jubilee on banks is what the powers that be care most about, of course. In fact, the whole bailout of 2008 was in essence a jubilee for the banks because we were told that without such a bank jubilee, the financial system would completely collapse, taking all of modern civilization along with it. Unfortunately, we never got to find out if that would be true or not. But the main reason that people would be concerned about a complete debt jubilee for banks is because of the completely bogus idea that banks would lose money if all debt were to be forgiven. This is completely untrue, as has been discussed many times at this blog, for example, at the following links. Long story short: every bank loan made since at least the early 1970s has been created out of thin air by the act of a natural or corporate person asking to be lent money. The upshot of that fact is this: if someone doesn’t pay back money that was never actually lent them in the first place(because it was created out of thin air), how does that hurt the “lender?” In other words, since banks “lent” fake money at no risk to themselves, there can be no injury to said banks if the fake money and fake debt is repudiated. So as far as banks are concerned, a jubilee is harmless—they lose nothing because they lent nothing. Everyone else, of course, is helped immensely by a jubilee. Suddenly, people have money to spend! They don’t have to pay back the fake “loans” that were nothing but intentional albatrosses placed around their necks. They can take that vacation, buy that car, computer, house, business, etc. Business would boom. People would be, in short, free. Always remember and never forget: banks don’t lend money they have on hand and therefore take no risk—and consequently deserve no reward. This entry was posted in Debt Slavery, Everything Is Rigged, fiat currency, freedom and tagged banks, jubilee, money out of thin air, Robert Reich, Rolling Jubilee, Strike Debt. Bookmark the permalink.